Change, he had falled short of the absolute majority required for victory. rigging has had to be employed to bring down his share of the vote. are being prosecuted accused of favouring the MDC. country into a political impasse and weakened the MDC’s momentum. estimate of 41.8 per cent, plus or minus 2.6 per cent. for a market in hard currency. but analysts were sceptical about the announcement. currency which traded at more than the US dollar at independence. shattered by Mr Mugabe’s misrule. to match buyers and sellers. He said the authorities were committed to taming the hyperinflation. blow to its existence,” he said. truly free market would be allowed to operate remained unclear. hard currency, he pointed out. “They give themselves the privilege of buying very cheap foreign currency. the country's electoral commmission say. the scene for a second round of voting. president's 43 per cent, the sources said on Wednesday. has already said that he has won the presidential election outright. the results of the presidential poll in order to rig the election. by the government sources had credibility. inflating their numbers to claim a false victory," the official said. said the opposition leader had won more than 47 per cent "but less than 50"
of the figures leaked by government sources on Wednesday. Chiweshe yesterday and he was waiting for results from different centres,"
parliamentary and senate polls, amid a worsening economic crisis. parliament after results of that poll were released. the governor of the Central Bank said Wednesday. buyer-willing seller... arrangement in the foreign exchange market,"
governor Gideon Gono said at a news briefing. will gradually improve to a point not experienced over the last few years." country has opted to liberalise its foreign exchange trading system. differences between the official and parallel rates. Economic experts said the move was long overdue. Mangudya, chairman of the Bankers Association, told AFP. "There was no need to continue starving the economy" of foreign exchange. reform programme and political tensions, according to critics. Wayne Munroe, a farmer in Nymandlovhu (just outside Bulawayo in Matabeleland South, Zimbabwe), has been under siege since early this morning. His property has been encircled by in excess of 100 "war veterans". He phoned the police in Nymandlovhu to inform them of the problem and was on the phone to them when 4 "war veterans" entered his office. He immediately told the member in charge that they were there and that a 303 (gun) was being pointed at his chest. He was forced to hang up. A tussle ensued: Munroe was injured on the hand with the head of an axe blade and he sprayed the attackers with pepper spray enabling him to escape. He was fired at 4 times, but they missed, and Munroe managed to get to the farm house where his mother and grandmother live. The war veterans moved into the compound outside the perimeter fence and are busy right now beating the workers. Munroe's wife and his two children, aged 4 and 5, are holed up in their own house some 100m away. One of the workers managed to escape the beating at the compound (which is outside the perimeter fence of both farm houses) and managed to get to Munroe. He told Munroe that after they finished beating the workers, they were coming for the farmhouses. Mrs Munroe (Ursula) managed to phone out that she was going to attempt getting to her husband, but has failed because more armed "war veterans" have moved in. She is currently there now. Senator David Coltart has repeatedly called Chief Inspector Munyira at Nymandlovhu to go and assist the Munroes. Coltart was told by the police they would send a detail out but at 3.10pm one - ONE - police officer arrived at the gate of the farm and then left. To add to the sinister nature of the situation, this morning the regular member in charge and various other officers were replaced at Nymandlovhu police station. This points to the fact that the police were not trusted to carry out this brutal assault. Yesterday Munroe was warned that there had been a meeting at stops camp in Bulawayo where the decision to invade had been made. SWRadio Africa (http://www.swradioafrica.com) are attempting to contact the Munroes. To prevent the Munroe telephone line from being blocked up with calls at a time of crisis we are asking the press to please contact SWRadio Africa directly for information. They will be functioning as an intermediary for press enquiries. to send an envoy to investigate atrocities against MDC supporters. 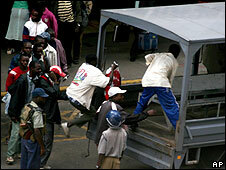 civilians as punishment for voting for the MDC in last month's elections. Community should be given the opportunity to mediate in the crisis. Mbeki to step down as the SADC mediator. election four weeks ago have still not been released. that 'we are looking very carefully at what they are doing'. crisis since independence from Britain in 1980.
have said it was clear Tsvangirai won the election. as to why they are taking that position. still feel proud to be an African seeing all the atrocities in Zimbabwe? houses all day, along with some farm workers who escaped from the compound. that Obert Mpofu, the local ZANU-PF MP, ordered this attack. houses, after they finished beating the workers. offered food or other scarce commodities for carrying out these attacks. Theron, the CFU Vice President, has been evicted from his farm. suspected opposition supporters and officials. constituency and was being blamed for ZANU-PF's loss in the area. can guarantee that safety are the ones ordering the attacks. non-governmental organization, Action Aid, in eastern Zimbabwe. post-election violence in the area. Kachingwe had been located by police in Manicaland province. disputed March 29 presidential election results. works to uphold human rights. The continuing failure of the regime to call duly elected councillors to office must be opposed. The City of Harare has been occupied by an illegal commission for 4 years. Local Government elections were held on 29 March and the winning candidates were declared duly nominated on 30 March. A month later, elected Councillors have still not been sworn into office in a flagrant breech of the law. This serves to emphasize the illegal and criminal nature of the regime. CHRA calls upon the elected Councillors to be pro-active and to press ahead with the business of Council, starting with neighbourhood meetings to inform residents about their intended policies for our city. CHRA is ready to facilitate such meetings. (c) in the case of a general election of councillors, on the day following polling day. (b) in the case of any subsequent general election or by-election, on the day following polling day. (3) Before undertaking any duty as such, a councillor shall take and subscribe before the town clerk of the council such oath of loyalty and office as may be prescribed. still far below estimates of other analysts. Robert Mugabe. He was speaking about Zimbabwe's government in general terms. unemployment rate of 80 percent. the country since the late 1990's. African Development Bank stood at $1.1 billion. Zimbabwe began to play its first war songs. Zimbabwe had reached alarming levels. thuggish militias of President Robert Mugabe, 84.
opposition claims. The police did nothing. A month after the presidential election there are still no official results. election and had made contact with the opposition. But than all contact had been broken off. newspaper City Press. 'And that's when the problem started,' he said. fear the retribution of the international courts. mission or special envoy to the country. many Council members found quite chilling." special envoy," said Dumisani Kumalo, the South African ambassador. defeat for him and his ruling party, ZANU-PF. want us to do," he said. country's High Court, without being officially charged. attacks by the governing party's youth militias and supporters. completed, but they have yet to officially announce the results for all 23. Zimbabwe gained independence from white rule in 1980. Zimbabwe dismisses U.N. talks as "racist and colonial"
and colonial" on Wednesday and said it would have no impact on the country. presidential election four weeks ago have still not been released. fail," Zimbabwe's Deputy Information Minister Bright Matonga told Reuters. results to be issued immediately. stand our ground," Matonga said. process could take a week. Mugabe has spread through the country. The government denies it is involved. and trucks to scare Zimbabweans into backing Mugabe. for his softly approach to Zimbabwe. power-sharing deal in a national unity government. aside and begin a peaceful transition to democratic rule. and soldiers took part in attacks on party members. from the auctions citing low prices. last week for them to offer us this nonsense." flicked tobacco leaves around the floor. rate widely used by service providers. country where inflation is running at around 165,000%. earning crop - were also delayed over a pricing stalemate. just 68.8 tons last year. a thriving parallel black market. facing chronic shortages of food, fuel and foreign currency. to time by the Reserve Bank," he said in a monetary policy speech. The top priorities would be food and agriculture inputs. revenue authority uses a rate of Z$270,000. It trades as high as Z$190 million on the black market. to set the rate because this is on a willing buyer, willing seller basis." Friday to get more detail on the new policy. percent from 4,000 percent and vowed to tame rocketing inflation. existence," he said, without giving further details. Zimbabwe's inflation is the highest in the world. the police raid on Friday. Rusere transferred to hospital where she died. campaign. Ngirande was warned against speaking out against Robert Mugabe. campaign of violence countrywide to condition the population for a run-off. carte blanche to do as they please without any legal consequences. observation, the army is arming Zanu PF militants. the election, which have yet to be released. watching Zimbabwe, waiting for the right time to move in. a commodities boom going on,'' she said. citizens' human and political rights. former Zimbabwean, said investors can help the country recover from Mugabe. interested in commercial agriculture as well as other real estate. years, waiting for a chance to expand. elections and stirring political violence. following last month's elections, whose results have not yet been published. the government to prepare people for a run-off. election on 29 March outright. in politically-motivated attacks in Zimbabwe since the polls. fraud as "evil" and a new phenomenon. a wave of attacks on opposition activists. But Mr Chihuri blamed the violence on those who were complaining. work this time around," he said. blaming the country's problems on the West. take over - seen as a reference to the MDC. attacks on MDC activists, by providing weapons and transport. "We have seen incidents of people being made to lie on their stomachs. home after being attacked by ruling party supporters. government]," Tendaupenyu Katongomara told a BBC contributor in the area. supporters ahead of a possible run-off in the presidential election. needed as no candidate gained more than 50% of the vote. been threatened by Zanu-PF supporters after working as election officials. at the start of term this week. people is evil and should never be allowed at all cost," he said. "This is a new phenomenon in the electoral history of Zimbabwe." but could not agree on what action to take. and violence, and the "use of food as a political weapon". members to send a special envoy and humanitarian assistance. Chinese Embassy in Pretoria, South Africa last Friday. Embassy seven days prior to the demonstration as required by the law. Revolutionary Youth Movement leaders, Simon Mudekwa and John Chikwari. obviously be in danger if they are deported back home any time soon . these areas as interim sub chiefs. The bloated, bloodstained king of an enchanted land takes centre stage. He extends his life vampirically by stealing the music from his people. Some he beats until they stop singing, others are persuaded to sell their melodies for Chinese tractors and other tat. His country's spirit dies - apart from the songs of hope people sing in their dreams. This was the motif for Dreamland, the opening event of Harare's International Festival of the Arts last night. The festival is an annual miracle that rejuvenates and encourages Hararians, in the midst of one political crisis after another, and cultural starvation for 51 weeks of the year. An astonishing collection of international, particularly African, talent arrives for a week of performances and collaborative jams with talented Zimbabweans. 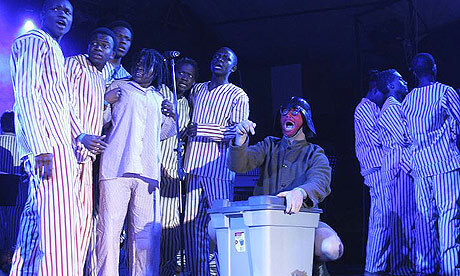 The product is a dense programme of acts ranging from Welsh opera to Malawian tribal dance. The highlights are always the cultural fusions, like Spanish reggae act Canaman and South African supergroup Freshlyground. As Dreamland begins, small choirs dotted around the arena sing Shona songs of love and freedom. One by one, they are silenced by storm troopers, who chillingly hood and throttle the singers before dragging them off-stage. The backdrop to the festival is that Robert Mugabe's youth militias are rampaging through the country, dishing out punishment beatings to those who dared to support the opposition on 29 March. A wave of refugees has fled the violence, but hundreds, including mothers and children, have been arrested in Harare on absurd charges and kept in squalid police cells. "It's the same old theme since 1980." As Katomene neared the end of her song, actors dressed as stormtroopers got on stage and clubbed her theatrically to the ground, stifling her last note. Also altered by context was Bob Marley's celebration of independence, Zimbabwe, performed by another superb female native vocalist - Chiwoniso. Zimbabwe needs to be liberated again, but this time not from white supremacists, but from a tiny clique of old men. The comedic high point of the show was the arrival of the king, tottering, hands dripping with blood, stuffed into military uniform. The crowd booed and jeered, only to burst out laughing, as the king sang The Jackson 5's Never Can Say Goodbye. The climax was John Lennon's Imagine. As the song progressed, dozens of young children tried to light candles. But it's a chilly, blowy autumn here and many times their little flames were put out. They kept trying and in the end, every child was a tiny point of light. It could have been a saccharine moment, but for the genuine earnestness of the youngsters and the poignancy of youth here. If Robert Mugabe was at State House last night, he cannot have failed to hear the sound of young Zimbabweans singing out their hopes for a better future, or of 3,000 Hararians cheering as the old man was mocked and derided. Zimbabweans feel that this could be the last arts festival of the Mugabe era. But that does not change the fact that these are tough and dangerous times. At least for this week, the festival is lifting spirits and inspiring activists to face the trials that are to come. outright treasonable things, on top of his many other human rights abuses. credit him with much intelligence. said no to him because he has destroyed the country in every respect. Has Thabo Mbeki's mediation helped? Zimbabweans by saying there's no crisis in this country. Is the army an obstacle to change? Will the army prevent him? If any commanders don't like him they must resign. We have rules. Is the land question settled since farms were seized from whites? the farms was not illegal. It should not be reversed, but polished up. has been destroyed by the Mugabe regime and will have to be rebuilt. Zimbabwe Unity Movement, challenged Mugabe but saw the results "managed"? Mugabe - he does not like contests. In one line, what will his legacy be? Esther (not her real name), 28, a professional living and working in Zimbabwe's capital, Harare, is writing a regular diary on the challenges of leading a normal life. Zimbabwe is suffering from an acute economic crisis. The country has the world's highest rate of annual inflation and just one in five has an official job. I am still living at home, with my parents and siblings. We are four working adults, but after church and a late breakfast on Sunday, we were discussing cutting down on meat consumption. Not for health reasons, but because of the incredible expense - having meat for supper every night, as we did when we were growing up, now costs Z$ 8-10bn per month. Converted to hard currency it is not much - about 50 US cents. But that is one person's entire monthly salary! So it looks like I am going to become a part-time vegetarian. Not a pleasant thought, as I love my meat. And Sunday breakfast used to consist of eggs, sausages or bacon, baked beans, nice crusty bread and creamy coffee. Now it is tea with lemon or powdered milk, eggs and stale bread. Well these times will certainly leave us leaner and healthier! I heard on the news (a foreign news bulletin) that our ZEC (Zimbabwe Electoral Commission) will be through with whatever they have been doing this past month today. I would call it verification, but they say that is the process they will be starting today. Hmmmm, interesting. I would like to nominate them for a prize. Their thoroughness is quite beyond belief. We are still waiting for the results, but the excitement is gone. Besides, it seems obvious who won as Zanu-PF is not crowing from the rooftops. It was a fairly quite week, although of course one keeps hearing of people being beaten up. I have heard people actually boast of how in their rural home area opposition youths avenged beatings so thoroughly that it has become a no-go area for the ruling party militia. The story is that the police no longer investigate cases of political beatings in the rural areas but just ask the complainants to sort it out for themselves. So now the youth from the avenged faction tend to go on a rampage of revenge. If these stories are true, then chaos is reigning out there - total anarchy. One of the reasons people gave for not believing Simba Makoni was a genuine opposition candidate in the presidential election, was that he had never been locked up for no reason and beaten to within an inch of his life. I think people have developed a kind of outer body experience concerning brutality. It is too painful to contemplate seriously that our police and army would rather do this than protect civilians. So there is a kind of distance in the mind, it is happening, and it is horrid, but it carries on.